In a large pot, heat the oil over moderately low heat. Add the scallion bulbs and garlic and cook, stirring occasionally, for 2 minutes. 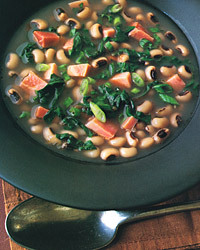 Add the Swiss chard, black-eyed peas, water, broth, Tabasco, and salt to the pot. Bring to a boil. Reduce the heat and simmer, partially covered, stirring occasionally, until the black-eyed peas are tender, about 20 minutes. Stir the ham into the soup and cook until the ham is warmed through, about 2 minutes. Remove the pot from the heat and stir in the pepper, vinegar, and scallion tops. Variations Instead of the Swiss chard, use your own favorite greens. Collard, mustard, kale, or beet greens would each lend its unique flavor to the soup. This soup has more than enough oomph to partner a rich California Syrah. Spicy blackberry and green-olive flavors, a strong earthy streak, and solid structure are its hallmarks, and all of these will go well here.